Hello all, as most of you know I've been talking about a software update for a while, I'm finally getting ready to start this and looking forward to it. A couple weeks ago Iain (a Robo-Tank user) made up a monitoring and management system flowchart to share with everyone, which I've done in the attachments, and encouraged me to make one for the software, well I took his advice and just completed it. This shows about 98% of the settings and how the GUI flows, I've added all the changes and went through the suggestions forum to find any I missed. Because I now plan to support a lot of hardware I'm re-writing the code so I'm posting this to get any suggestions from you, now would be a good time to mention them. Add auto light mode, this uses sunrise and sunset time for start and stop times, these can be adjusted to any start/stop times. Using this mode the lights constantly fade and you can set the max brightness for each channel. If anyone can think of changes or additions please let me know. EDITS will be added below. Wow great ! I'm looking forward to this update ! Good news!! Good job!! Great!! Manual control of DC accessories? Maybe on the same page as the manual control of the AC outlets.. That way if I have a 12v utility light, fan, or pump or something I can control/override it manually. A way to enter and store manually taken chemistry readings, like a journal? A graph of such data would be nice too. Thanks guys, and I like the suggestions. 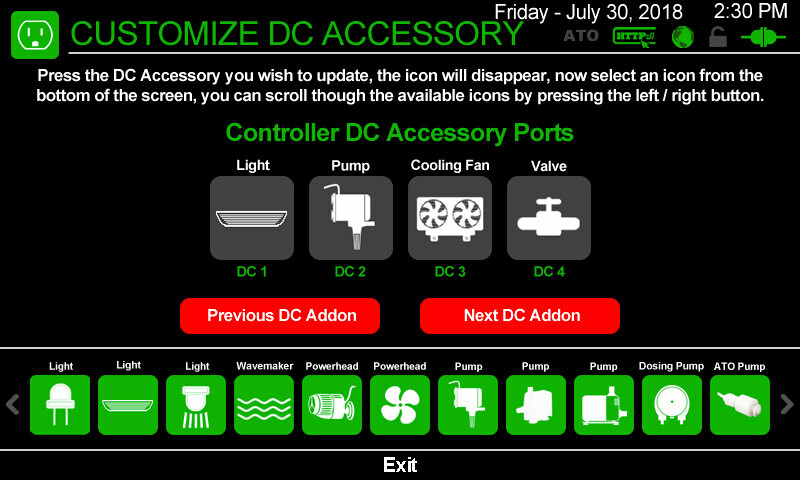 I will be adding manual control for the DC accessories but on a different page than AC outlets. 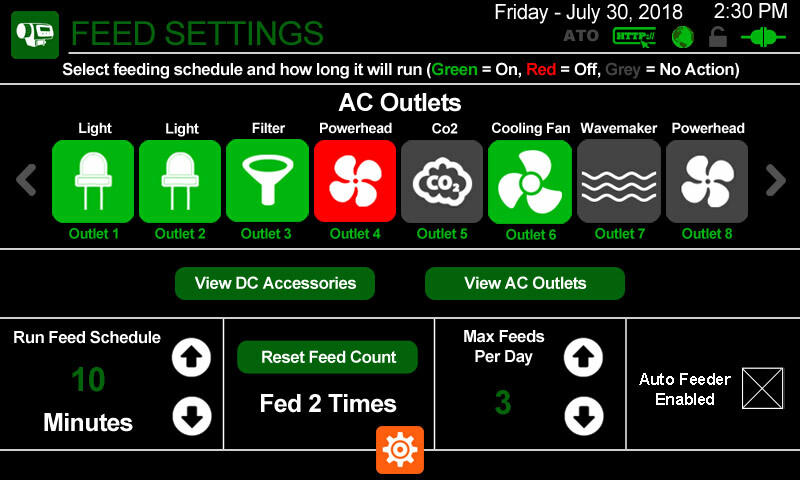 If the home page is showing DC accessories and you touch that section the manual screen will appear, same as AC outlets, if not viewing you can use a shortcut on the dock to access it. I've updated the flowchart with this option. I never thought of a journal but am going to create a detailed maintenance log, maybe the same? In the maintenance log settings the user would select any of the available parameters to add to the log and there would be 5-10 custom fields for manual entry. You would add field names here and when the maintenance screen appears it'll prompt you to enter the data in those fields. There will also be a "notes" field. The idea was after maintenance is completed, a button would be pressed to add to the maintenance log. It could also be setup to add to the log at any given time. With all that said maybe a separate journal would be better? Are you thinking wireless connection from controller and display? I guess that's something that could be done in the future. My thought has been if it was wireless you still need to plug in DC power to the display and currently it only has one Ethernet cable plugged in so either way you have a cable. If they had wireless DC power I would be all in. :) I guess it does get rid of that cable across the living room. I am planing wireless for AC power bars and hopefully other things so when I do that I'll probably add the option. You can view an IP camera on the webpage today, you have to open the index.html file on the controller SD card and make a few changes in the code and the image will appear at the bottom of the page. It's a full page view and shrinks with smaller screens. If you go to page 65 in user manual it'll explain how to change it. When I get to the web side I'll improve this. One day I will work on full web access, display would be optional, but it'll be a while until that happens. First I want the controller setup without requiring more major changes, Gen3 and v5 will do that, then I want to focus on some other sensors and some addons that will control specific power heads. It is on the list though. The speaker is something I've dreamed about since I started this project, not a good thunderstorm without thunder. :( I also want to setup a rain system, thinking a pump would go in a reservoir or sump and pump water into a pipe/pipes hanging over the tank with holes in the them. The pump speed would be controlled to change rain intensity. So yes this will be coming sooner than later. (06-25-2018, 11:44 AM)Irass Wrote: Wow great! Hi Irass, sorry I missed your post. I haven't outlined the pages yet but working on that now, as I make changes to different screens I'll post the images. What do you think about the android app? full control and management of the controller. I have thought about an app but I'll probably do a website instead so it works on all devices and yeah the end goad is full control. Thinking about the rules I set up with my return pump and "display high" float switch.. Is there a way, or should there be a way, to require an active acknowledgement of an alarm or condition before the system restarts something? For instance, if my "display high" float is closed and the return pump stops to prevent an overflow, I'd like for absolutely nothing to happen until I look at the display and it says, "Hey dummy, something's wrong!" and I have to press "reset" or something.. I know I can set up an email and an audible alarm, but maybe it would be easier, or just nice, to have the option of categorizing a rule as a "warning" or "emergency condition" that pops a warning up on the screen. From what I understand right now, say if my "display high" float triggers the return pump to stop, it just stops, and other than a buzzer (which could be anything else) or an email, I can't see right away what the problem is. This's basically how the ATO is setup, if something happens the ATO will be disabled and not work again until a manual reset is completed. I never thought of something like that for custom rules and can see that as a valuable option. I plan to have 2 extra options, one for audio alert and once for home page alert, these would trigger with rule and could be tied in. Maybe an option could be added called "fail safe", if this is checked and the rule is triggered it would permanently stop/start the equipment selected. Once the alarm is cleared the rule would be reset and the equipment would resume based on other custom rules or schedules, how does that sound, can you think of better? I could also add a "failure log" that would only log things checked "fail safe"? Hi Dale, if you got water everywhere you didn't do it right lol :) Running off plexi sheet is a good idea, but yeah like you say not much to it. The pump could run on a port that controls the speed so the water flow can be controlled for drizzle or heavy rains. The page below is the Settings page, you access this page from the Home Page Dock. The page below is the Hardware page, you access this by going to "Settings" and selecting "Hardware". Below are 3 images for the dosing pumps. All the settings will be accessed from one location. 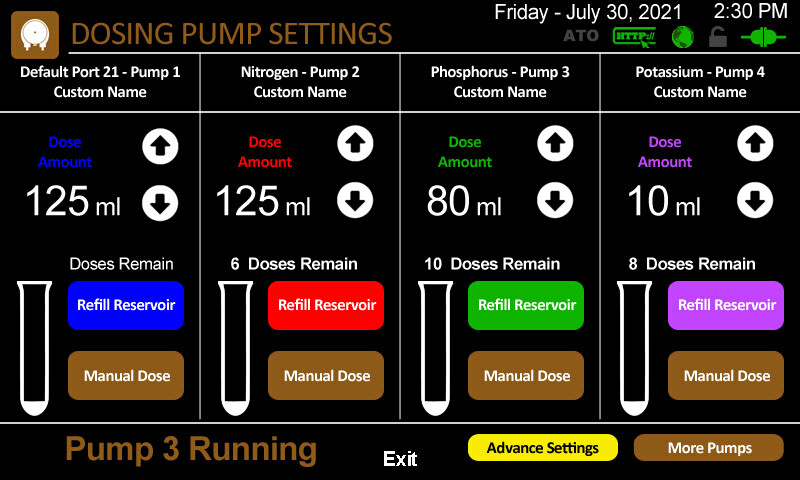 To get here go to "Settings" and "Hardware", then select "Dosing Pumps". These are the main settings for adjusting the dose amount and refilling the reservoir. When you press "Advanced Settings" you get image 2. 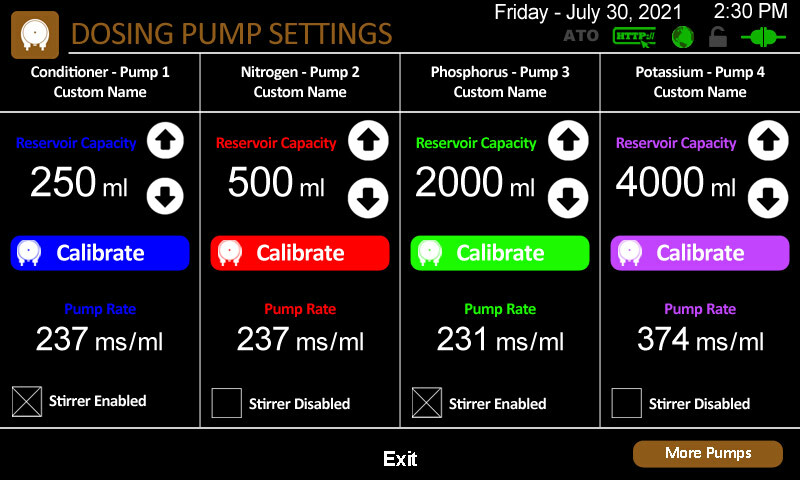 On image 2 you set the reservoir capacity and it shows you the pump rate of each pump as a reference. You can enable a stirrer for each dosing pump, when that's enabled the stirrer will run first for 30 seconds, stop and 5 seconds later the dosing pump will run. You can also enable a home page notification when the pump runs. When a reservoir is empty you'll also get a one-time notice on the home page. If you hit the "Calibrate" button you'll get image 3. 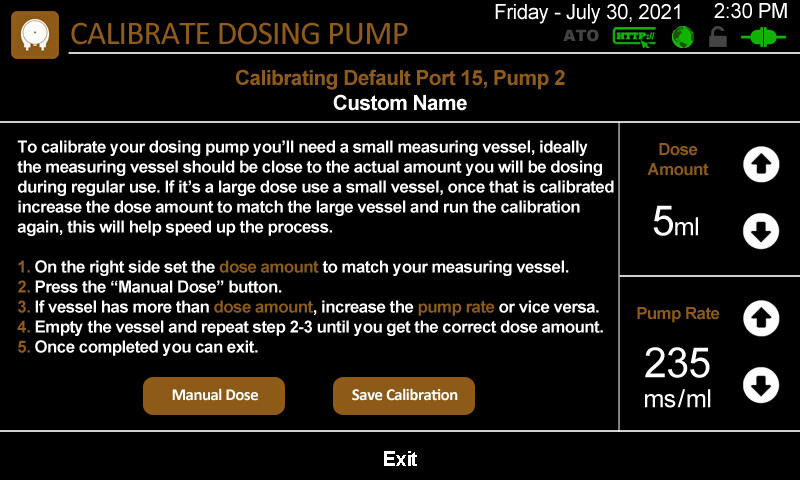 This explains how to calibrate the dosing pump, you can set the test amount and then adjust the "Pump Rate" until you get the correct dose amount. 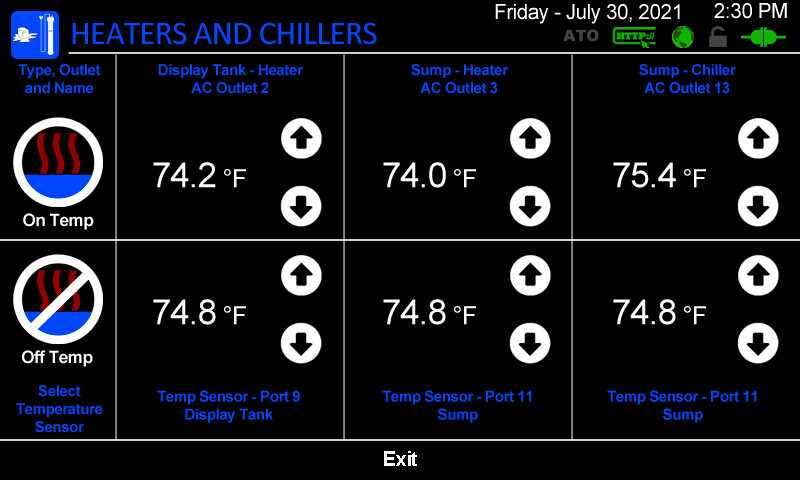 The next two pages are for the heaters and chillers, you get here by going to "Settings" and "Hardware", then select "Heaters & Chillers". I'm going to limit this to 3 heaters or chillers, if a person needed more you can use custom rules to achieve the same thing. I almost took this out but thought it was a little easier to use for beginners. 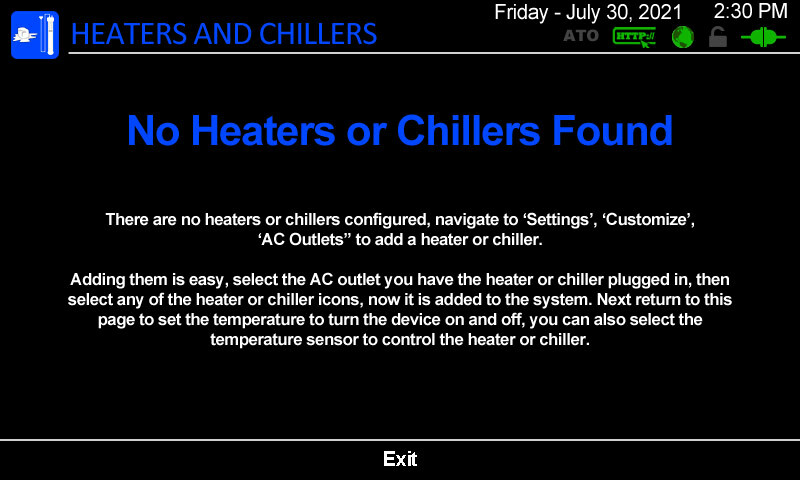 This system looks at the AC outlet icons, if it see's a heater or chiller icon you'll get page 2 otherwise you'll see page 1. On page 2 you can see the custom name and the AC outlet being used. 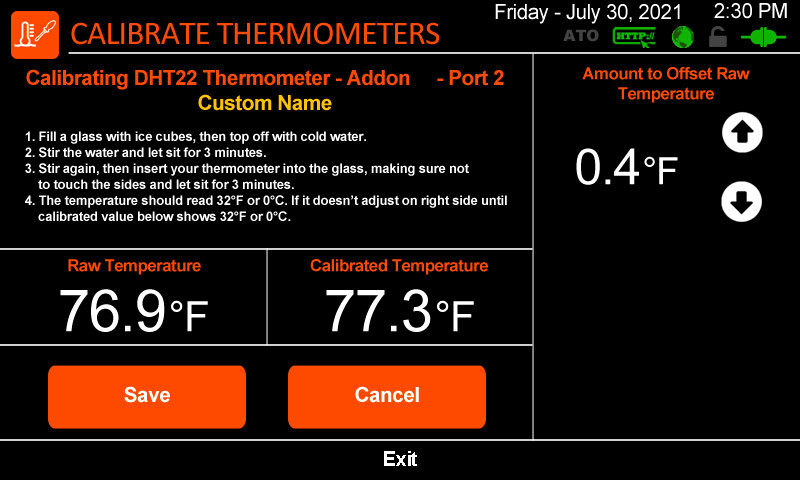 If you press that area you can change the custom name, this will be used on equipment logs etc... At the bottom it'll show you the temperature sensor being used for control and the custom name for it. You can press this area and change the temperature sensor. The page below is to select the ports on the controller that you'll be using, you access this by going to "Settings" and "Hardware", then selecting "Equipment Connected". If something isn't checked you won't see it on any other screen. If you press the "Edit Addons" button you'll be able to do the same to any connected addons, I haven't drawn this page up yet but will be similar. 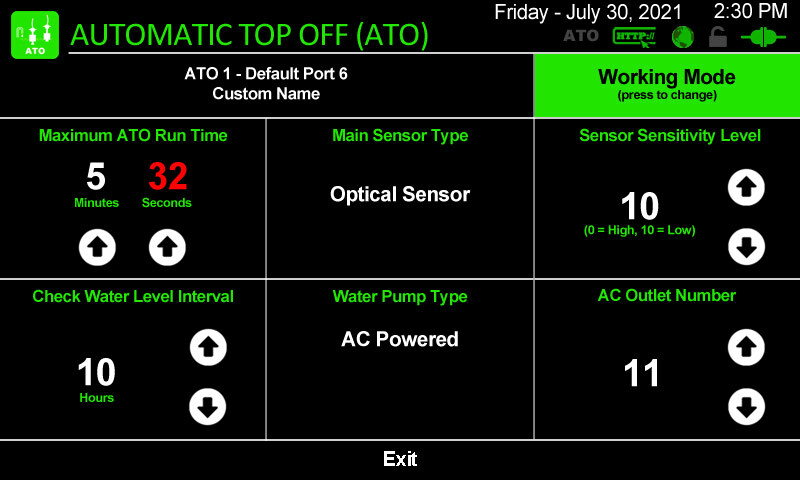 The page below has all the settings for the ATO, you access this by going to "Settings" and "Hardware", then selecting "Automatic Top Off". 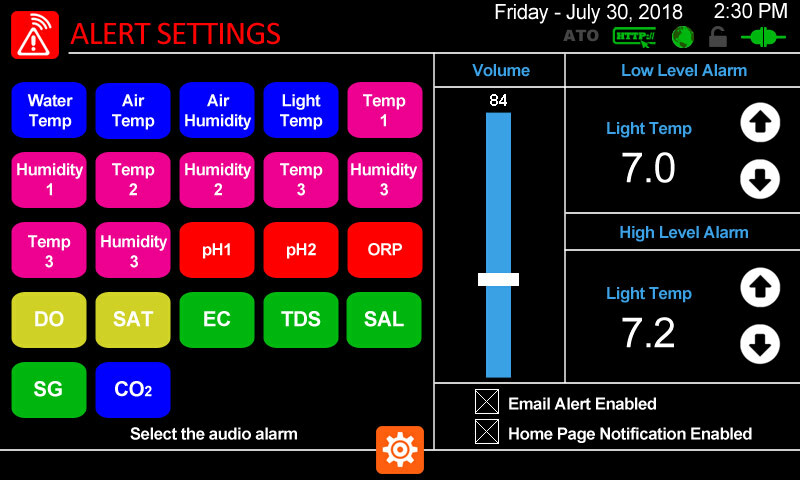 I think everything on this page is self explanatory, the Alert Volume is how loud the beep is if enabled. If "DC Powered" water pump type is selected the section showing the AC Outlet Number will be hidden. For the Maximum ATO Run Time, you press minutes or seconds, the selected will turn red and the up/down will adjust it. The large green section top right allows you to put it in a test mode by pressing that section. The page below is for the Atlas Scientific circuits, you access this by going to "Settings" and "Hardware", then selecting "Atlas Scientific Circuits". I removed the checkboxes for enabling a circuit, in v5 the system will automatically know if it's connected. The section to select a circuit for calibrating will only show the connected circuits. I'm going to increase the amount of circuits that can be connected as well. 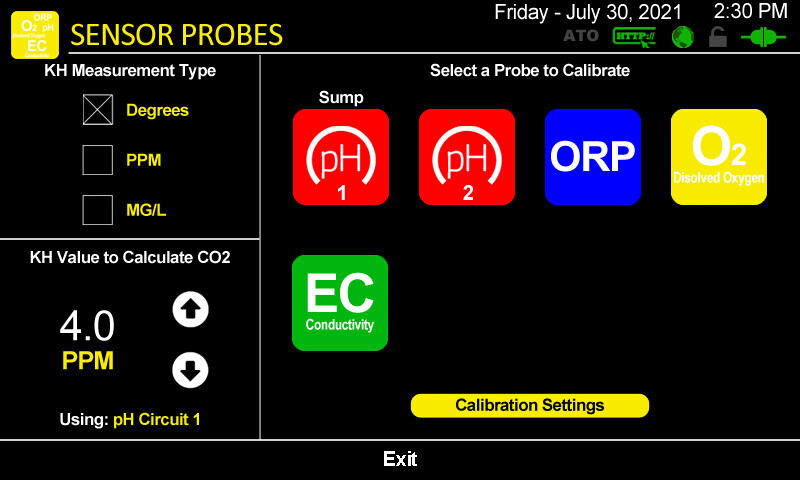 The next 6 images are for calibrating all the DS18B20 and DHT22 temperature sensors, you access this by going to "Settings" and "Hardware", then selecting "Calibrate Temp Sensors". Image 1 is what you see after selecting the sensor to calibrate. It'll show you the port number and custom name. You can choose from 2 calibration types, the 1st one, "Offset Calibration", would use a thermometer you trust and adjust the offset so the DS18B20 matches. You can see this on image 5 below. 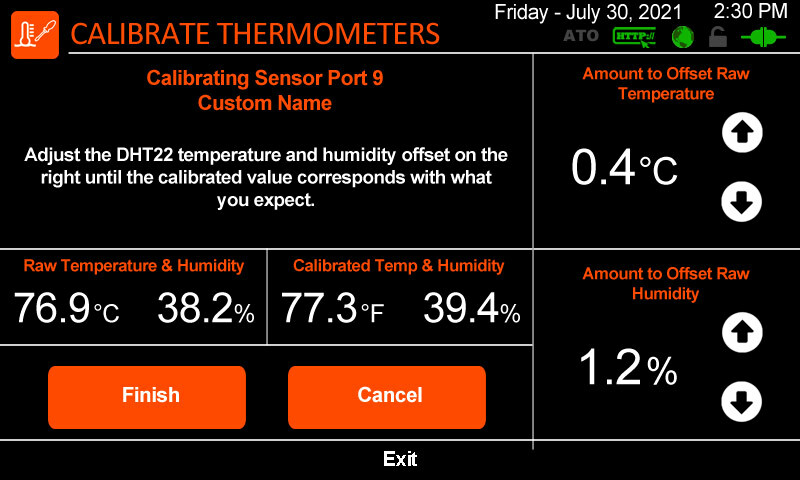 If you're calibrating a DHT22 you can only use the "Offset Calibration" method and can adjust both the temperature and humidity, see image 6 below. Image 2, 3 and 4 are for calibrating a DS18B20 with a 2 point calibration method using boiling water and a triple-point bath which is ice in water. In step one, image 2, you can look up the correct temperature water boils where you live and set the correct level then proceed to calibrate. 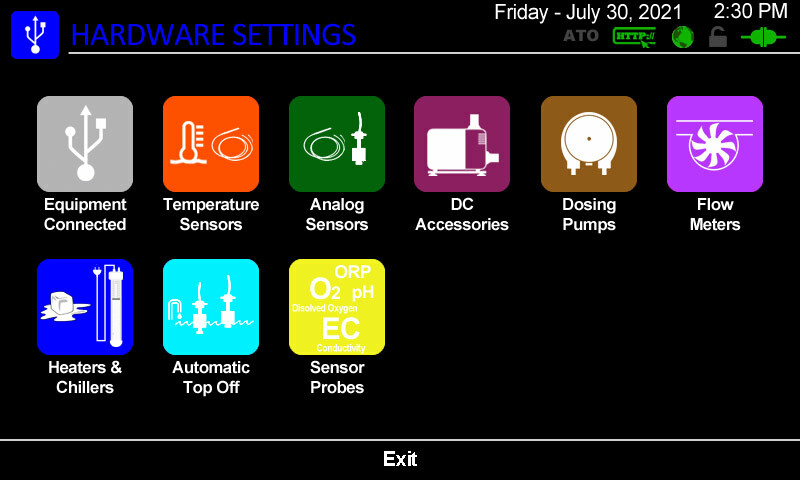 The page below is for the flow meters, you access this by going to "Settings" and "Hardware", then selecting "Flow Meters". 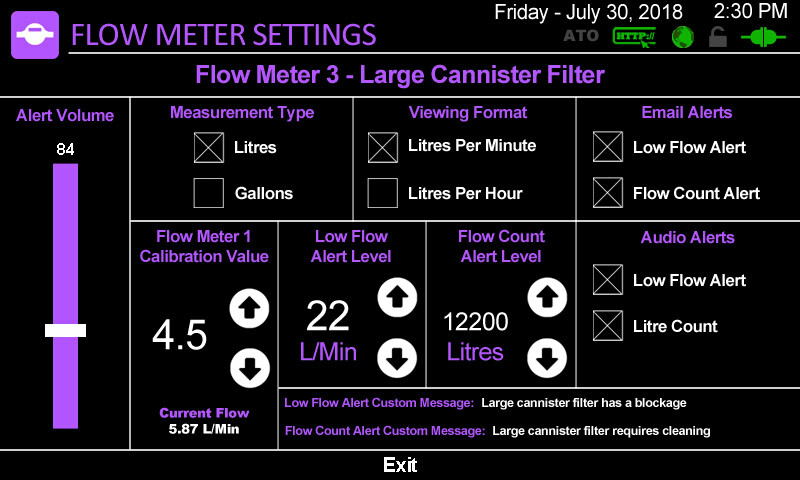 Before seeing this page you'll be prompted with a list of flow meters connected, once you select the flow meter you want to adjust you'll see the following screen. Here you can adjust all the settings, at the top you'll see the flow meter number and a custom name, if you press this section you can change the name. If "Measurement Type" is "Gallons", the "Viewing Format" will show "Gallons" per minute / per hour. You can setup a low flow alert and a custom message to display on the home page, if you press that section you can change the message. The 3 images below are for the custom rules, you access this by going to "Settings" then selecting "Custom Rules", there will also be a shortcut icon available for the home page dock. On image 1 I've added 3 new icons for alerts, audio, email and home page notification. You'll also be able to press the enable button to disable the rule temporarily. On image 2 you can't see any changes however only sensors connected will show up. 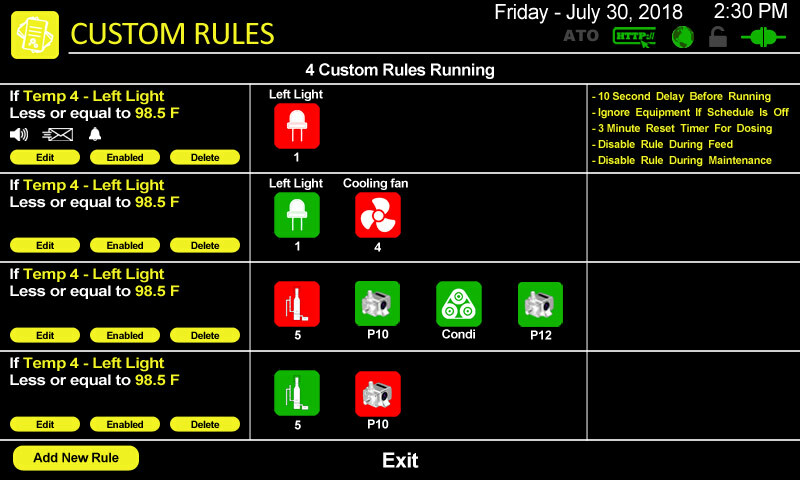 On image 3 I've added check boxes for the 3 alarm types and added a fail safe system, I'll probably change the name. This will allow the rule to only run once and would need to be manually reset. You could use sensors where overflows may occur to shut down different parts of the system until you can correct the issue. The next 2 images are for the light modes, you access this by going to "Settings" then selecting "Light Modes". 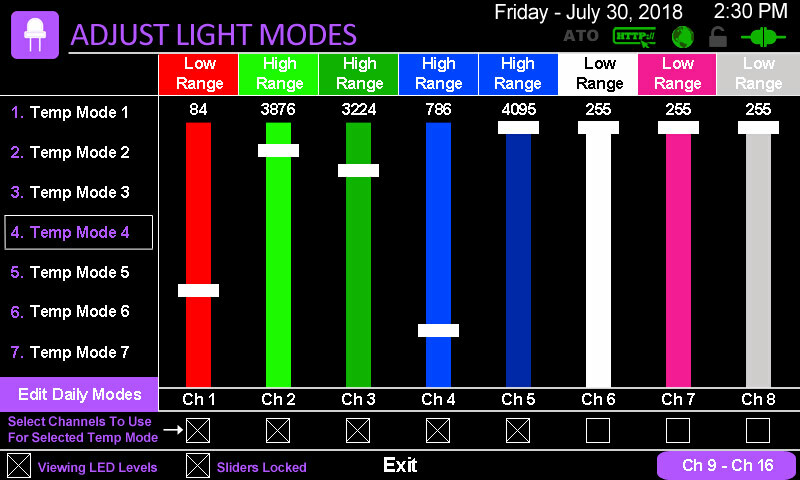 When you enter the light modes setting you see the 1st image, here you can setup the light intensity for the 7 daily light modes. The controller will start the day from Dusk - Sunrise - Morning Sun - High Sun - Evening Sun - Sunset - Night and back to Dusk. In the schedules you can set the time of day for each light mode to start. At the bottom you can lock the sliders and change the view above the sliders from a value range of 0-4095 to percentage from 0-100%. Near the bottom left side you can press a button "Edit Temp Modes" this will take you to image 2. Image 2 is for setting up the temporary light modes. There will be a total of 7, each mode will have a shortcut you can add to the home page dock if you wish, this will allow you to turn it on/off with on click. This page works the same as page 1 but you can press and hold the mode name section and you'll be able to change the name. There's also an important setting under each slider which you use to tell the system which channels are used for the selected temporary mode. I'm adding this so users can take advantage of all 16 channels easier. This will allow regular control for the aquarium and also allow you to control LED strip lights or any 12v DC LED light independently. Now lets setup some temporary light modes... On the temp modes page, image 2, lets use Temp Mode 1-3 for the LED strip lights around the living room. Adjust the 8 channels being used for each mode to get the colors and look you want, remember to check the box so it knows those channels are for those lights. Now do the same for the LED's above the desk and we'll just use the 4th mode light modes for this to turn them on full, remember we only enable the one LED channel for this mode. 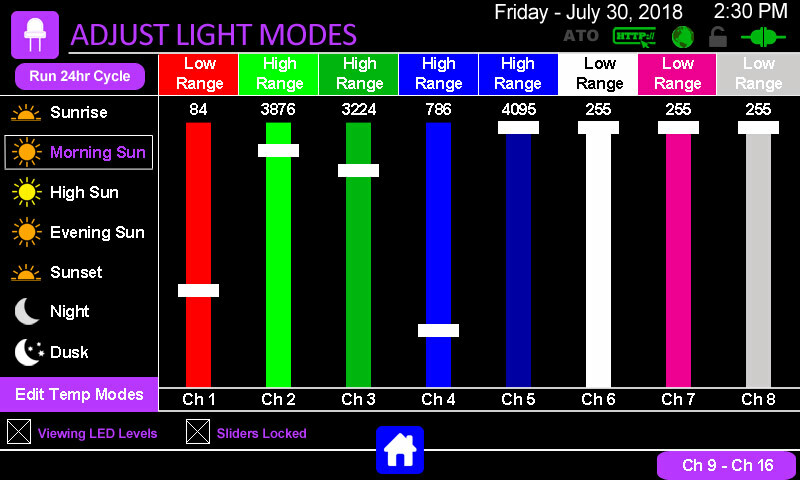 Now we'll use the 5th mode for the lights under the aquarium and have it turn them on full. Now we have 2 light modes left, lets use them for aquarium, one could turn the lights full power good for tank maintenance and lets setup the last one for when you feel in the mode to chill out with your fish and want special lighting. Now we want to access these light modes easily so we'll add shortcuts for each light mode to the home page dock. Now if we press light mode shortcut 1-3 the LED strip lights around the living room will turn on and press again it'll turn off. For now we'll leave it on. Now press the shortcut for light mode 4 and the desk will turn on, press light mode 5 and the light under the aquarium will come on and during all this the tank will still be looking good and dimming according to schedule. Now hit the shortcut for mode 6 or 7 and the tank will change to what you setup. To restore the aquarium to regular schedule press the resume button on home page dock and everything is back to normal. 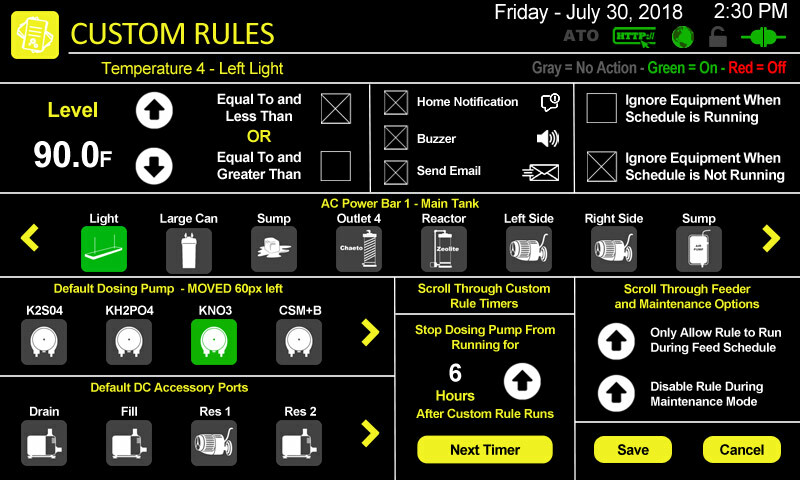 So now you have independent control for 4 different lighting systems and one that dims. 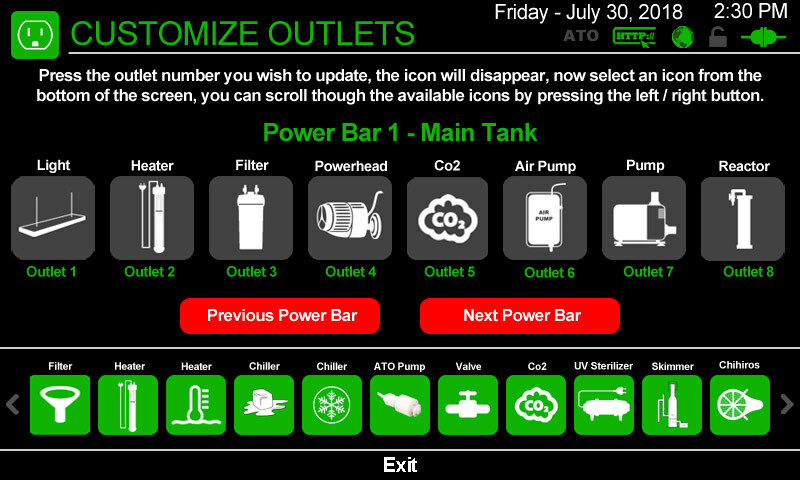 The page below is for customizing the AC outlet icons, you access this by going to "Settings" and "Customize", then selecting "Customize Outlets". On this page you'll see all 8 outlets for each power bar and can navigate between the different power bars connected, it'll show you the power bar number and custom name. You can press the section with the name to change it. And a big THANKS to Iain Bonnes there are now 55 icons to choose from, he custom made about 37 different icons, most for the AC outlets. The page below is for customizing the DC Accessory icons, you access this by going to "Settings" and "Customize", then selecting "Customize DC Accessories". This is the same as above, the controller has 4 DC ports and if you have addons plugged in for more DC ports you can scroll through them. There's 22 different icons for these, they're all the same being used for the AC outlets. Reading your last post, a question about temp led modes. is there schedule to be able to switch off/on automatically during the day? Here's some more screenshots for v5.0, I'll explain as I go. Any feedback is welcome. 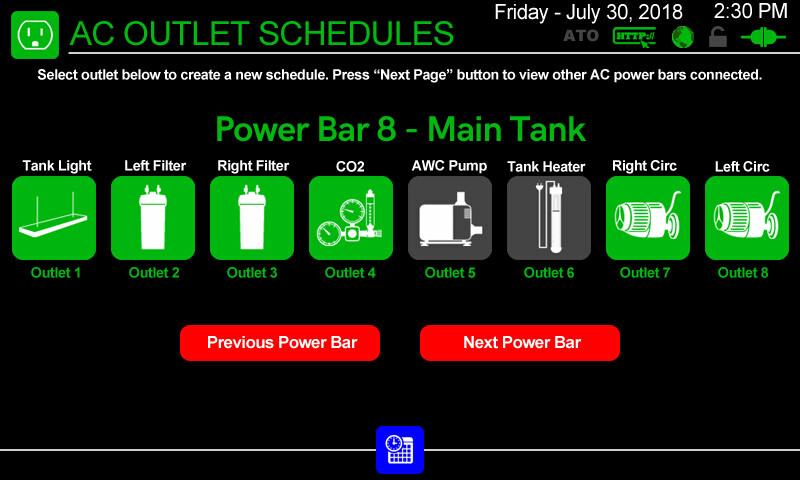 I'll start with the AC outlet schedule screen, the dosing pumps and DC accessories will have the same layout. There's 3 screens total. 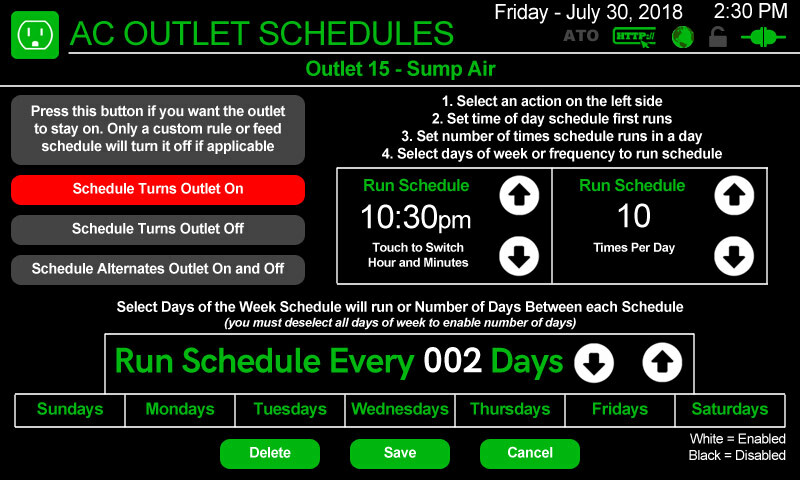 The 1st screen you'll get when entering the AC schedules, you access it by going to settings, schedules, and press AC Outlets. 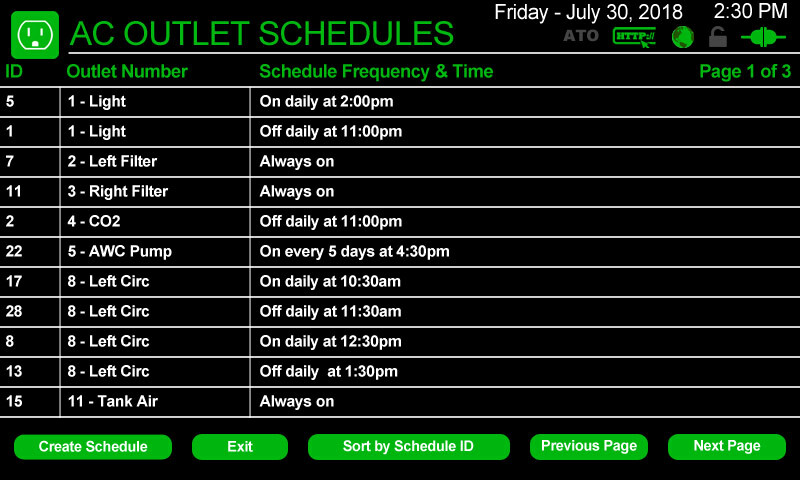 You'll see a list of all schedules for all AC outlets, you won't have to view each outlet one by one to see if anything is set. This list will be sorted by outlet number so it's easy to read. If you press any of those schedules you can edit or delete it. Once you press "Create Schedule" you get the 2nd image. Image 2 is just a list of the power bars plugged in, if you only have 1 power bar you'll only see 8 outlets. Press any outlet and you'll get image 3. Image 3 looks a little busy but I think it'll work, if you have can think of something better please let me know. I'm hoping with all the text and using it things will make sense. It's basically 4 sections, you press a button on the left (section 1) and right side (section 2) and can only select one of each, the selected option will turn red. The middle (section 3) is to adjust the minutes and it'll change according to the selection on the right side. The bottom (section 4) is to set the day frequency of the schedule. In the example on page 3 it'll turn the air pump on/off every 10 minutes but only on Sunday, Tuesday and Friday. If you press a day in the bottom boxes the "number of days" section will disappear, if your remove all days at the bottom it'll reappear. On a side note, running a schedule like I outlined would or even more often would shorten the life span of the relay in the power bar. The standard power bars have electromagnetic relays which are typically good for 50,000 to 100,000 switches, sounds like a lot but running this schedule for 347 days would be 50,000 clicks. If you setup something to turn on/off every 5 minutes it would only take 173 days and the clicking would drive you nuts. :) Soon I will have solid state relays as an option for the power bars. They cost more but their silent, instant and easy to get 50 million switches out them. 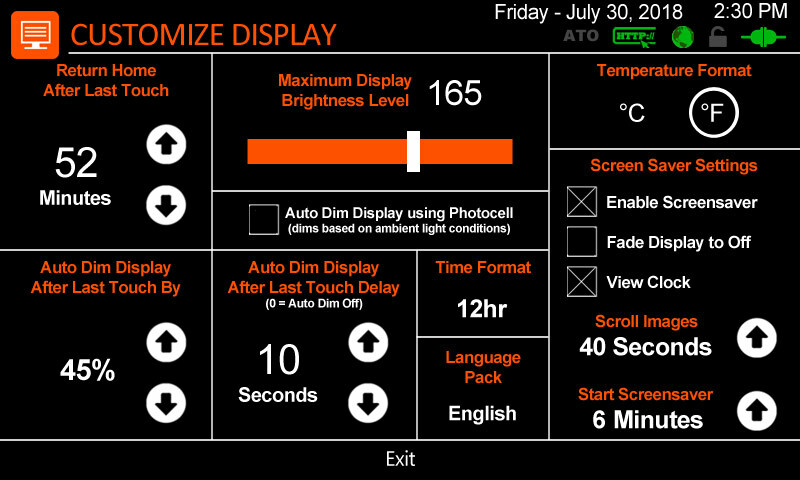 This will be the screen for the display settings, you access it by going to settings, customize, and press display. 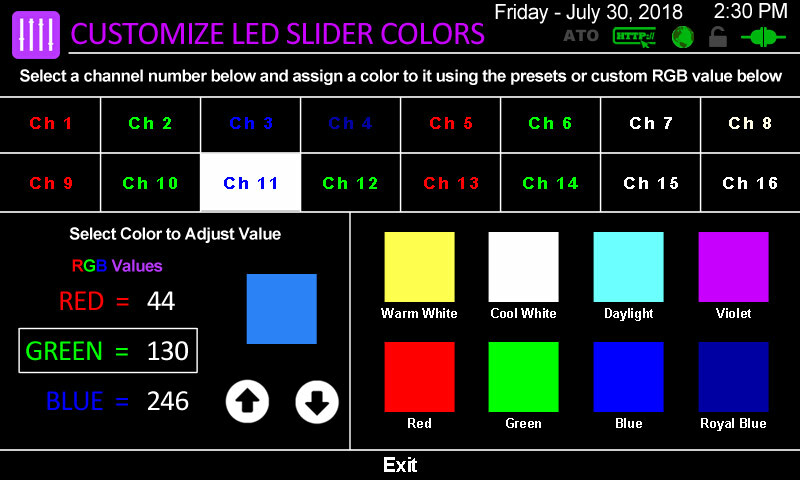 This is the screen to customize the LED slider colors, I added an option for custom RGB values. 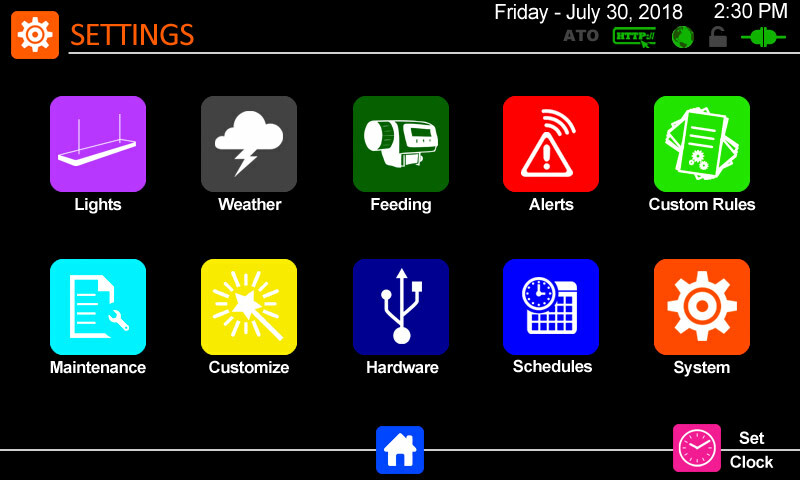 This is the updated screen for the alerts, you get here by going to settings and pressing Alerts. On this page I've added the option for emails and a home page notification. 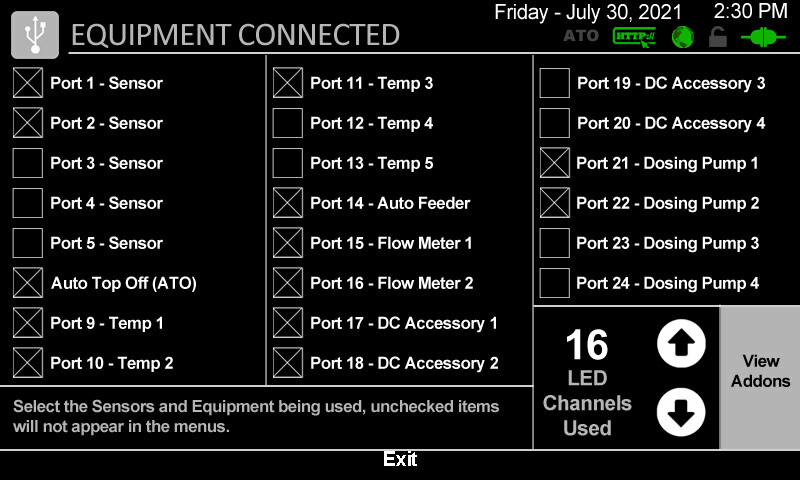 This is the screen for the feed schedule, to get here you go to settings and press Feeding, now you'll be able to also turn on/off DC accessories and set the max number of feeds per day. The next 3 screens are for setting up the storm, this is only for the lights currently. You get here by going to settings and pressing Weather which I'll probably change to Storm. On the 1st image you can set the min/max length of storm and a random between those will be used. 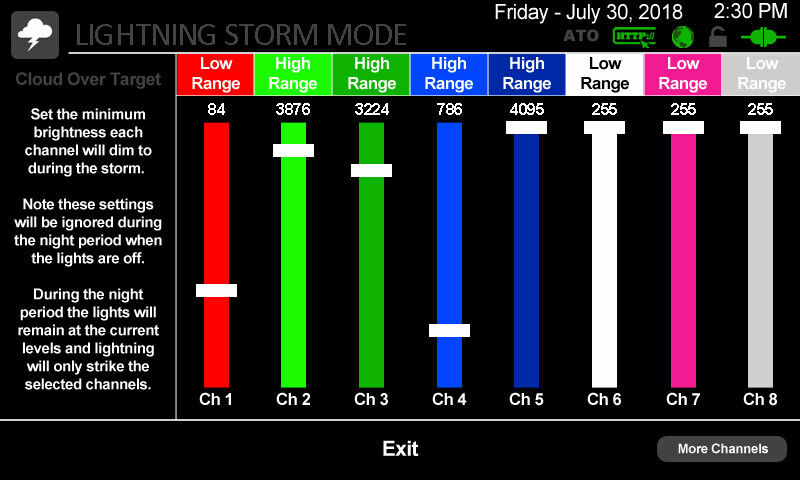 You can also select which LED channels are used for actual lightning. 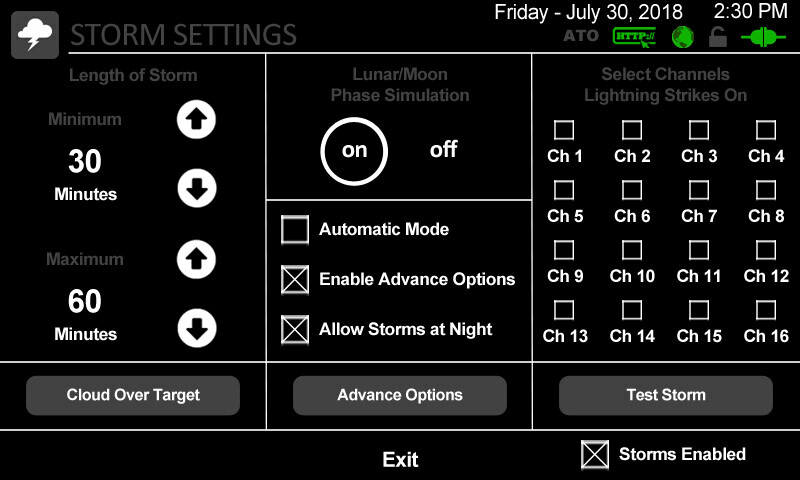 You can also turn the moon phase on/off, this will simulate the brightness of the moon by adjusting the brightness of night light mode. There's also a button to start and stop the storm so you can test it. If you press the customize button you get image 2. 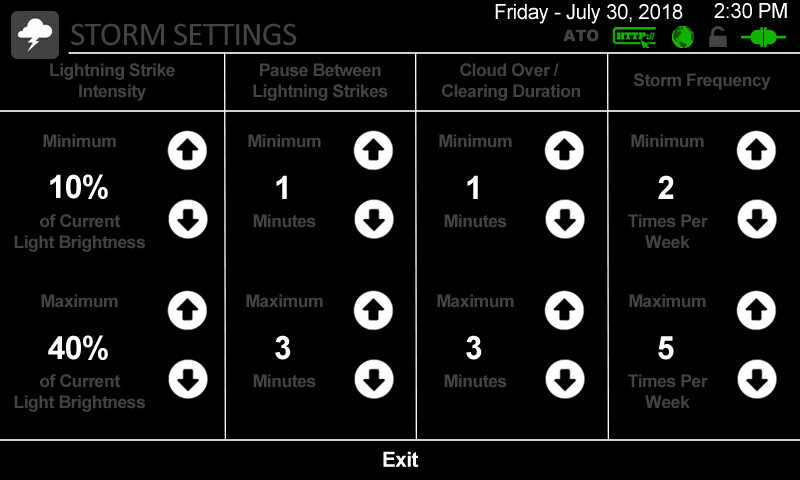 On image 2 you can set a min/max brightness for the actual lightning, set a min/max time between each strike and set a min/max for how long the cloud over and clearing duration is, random numbers will be generated between the min/maxes for intensity and duration as the storm runs. If you press Cloud Target on the 1st image you'll get image 3. Here's you can set the brightness of the LED's when the storm is running, when the storm starts it'll first fade to these settings and when storm is over it'll go to whatever mode the lights should be in. I've had the storm running in previous versions and leaving it the same because it works pretty good. One nice feature is random LED channels from the list you selected will be used for the lightning and some strikes it'll use 2 channels. So you might get lightning on the left side, right side or maybe even both depending how your LED's are setup. If the storm runs at night when the lights are dim or off the lightning is also dimmer so the fish aren't freaked out, it can look quite real if the tank and room are in darkness. 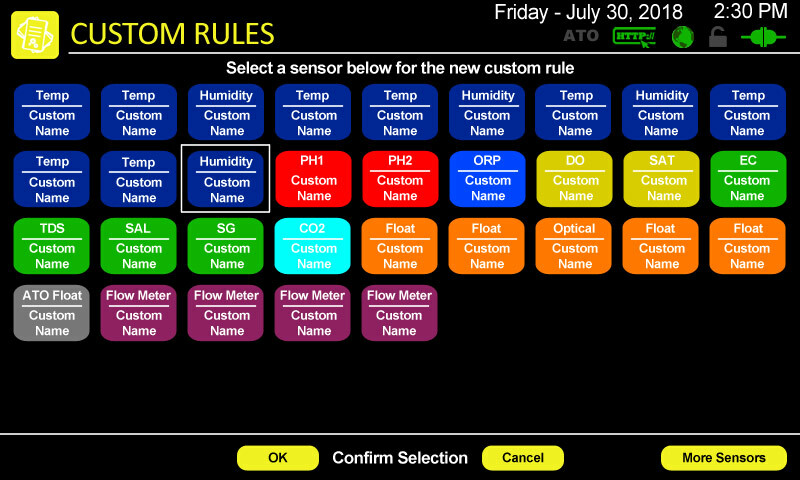 In the post before tonight I updated the flow meters screen with some extra settings for the flow count alarm. Nice! I don't think screen 3 is overly busy, pretty easy to understand when looking at it for a minute or two. I like it when sections appear or disappear (or grey out) when not applicable.